During his 40 year career, Gordon has played in pretty much every kind of venue in the UK from the grandeur of Birmingham's Symphony Hall to tiny, out of the way village halls. He enjoys performing in all types of venues and particularly loves the challenge that the smaller venues present where the front rows of the audience are 'up close and intimate'. This is where YOU come in. 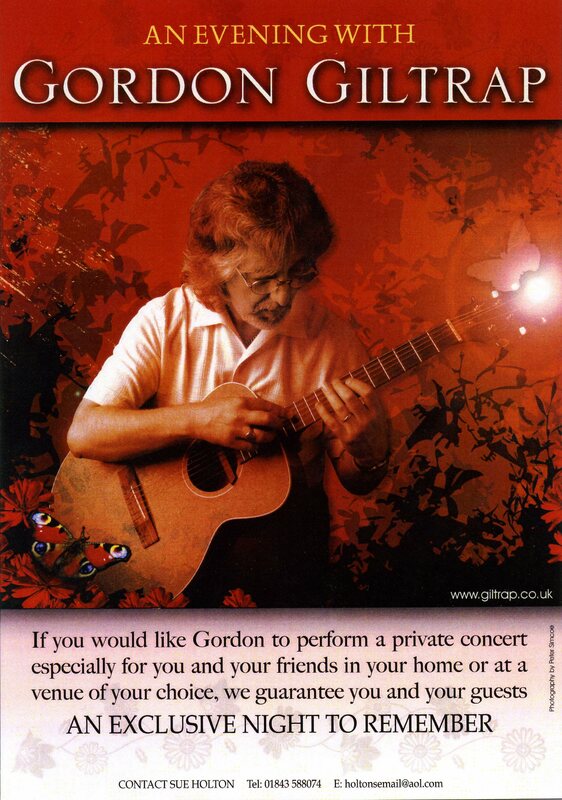 If you would like Gordon to perform a private concert especially for you and your friends in your home (or at a venue of your choice) then call or email me. See the Contact page. We do need to make it clear though that these concerts are not suitable for some functions but are for listening audiences to enjoy the fun and, of course, the outstanding guitar playing that everyone has to come to expect from a Gordon Giltrap concert. To find out more, please get in touch using the details on the Contact page. If you prefer the sound of the classical guitar, you can also book a private performance by Raymond Burley using the same method.